If you celebrate Christmas at your house and you have passed down the tradition of leaving cookies for Santa, you may want to include your kids in making those little nibbles for the big guy in the red suit. Preparing the morsels for Jolly St. Nick can increase the excitement of his pending arrival. 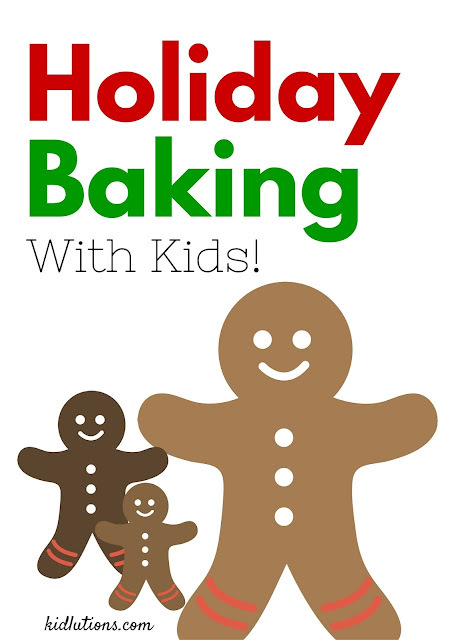 Baking with children in these instances can be a great time of bonding with your little ones but can also be a trying time if you don't follow a few of the tips and hints listed below. 1. Pick a Day where it’s the only thing on your calendar. Make sure you allow plenty of time (patience is a must on your part…see more in item 6 below) so you don’t have to rush little hands or clumsy attempts at putting flour in the bowl. Remember, you’re building memories, not masterpieces! 2. Rest up, Eat up! Make sure everyone is well rested and has eaten a nutritious meal prior to baking. Sampling cookie dough is a huge temptation, but one that should be avoided due to possible contaminants in uncooked eggs. This is a great opportunity to teach about health. 3. Wash Up! Make sure everyone washes their hands thoroughly prior to beginning your venture in the kitchen, and then as needed as the day progresses. Make great fanfare out of scrubbing those hands. What holiday tune will your family sing while washing those phalanges? 4. Fun for All! Make sure each child gets a turn doing the “fun” or exciting things, like using the mixer, watching things spin around (ohhhhhh, I remember that day in the kitchen over four and a half decades ago…chocolate cake batter EVERYWHERE…sorry mom…but those memories are still fond) and choosing personal favorites to make. 5. Be Patient and expect spills and messes. Clean up as you go! Enjoy the process as much as the finished product. 6. Allow Mistakes because they are our best teachers. You better believe it. The same is true for our children. Embrace mistakes and support and encourage success! Helping kids deal with disappointment is a life-long skill, whether it’s in the kitchen or elsewhere! 7. Individuality Reigns Supreme Let kids bring out their inner Picasso’s while decorating and embellishing their cookies with sprinkles, doodads and whatnots! 8. Be Prepared! Make sure you have all the necessary ingredients for each and every single recipe before you begin. Don’t say I didn’t warn you. (Especially if you live in a rural town where everything closes down at 8pm. #TrueStory.) If you’re super busy like most of are, you can order specialty items (and even everyday use things) online and have them delivered at your doorstep. Really! Whatever you make with your kiddos, enjoy! Remember, you're not just making cookies, you're making memories!